Once upon a time, a kind and innocent man worked as a gardener in the king's palace. His work was to water the plants and remove weeds everyday in that garden. There also lived few monkeys in a tree in that garden. The Gardener was very kind towards to those monkeys. He used to offer them fruits and food. 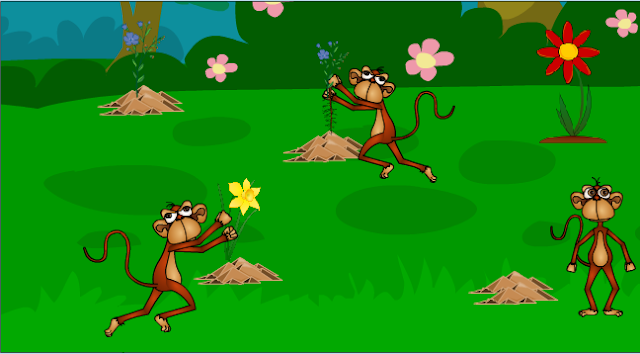 The monkeys soon learnt to imitate the gardener. As the gardener weeded and watered the garden, the monkeys also did exactly what he did. The gardener was happy to see this help from those monkeys. One day, the gardener had to visit his relatives in the nearby town. He thought about an idea. He called the monkeys and told them about his visit to the nearby town. He asked, "Can you all water my plants for one day, like the way we do it everyday? I promise to get sweets and fruits for you all." The monkey were excited about the offer. The all nodded their head to say yes. The gardener was very happy and left to his place. When the time came to water the plants, all the monkeys gathered to start the work. Though they knew how to water the plants, none of them knew about the amount of water that should be poured to each plant. The head of those monkeys suggested a plan, "Let us pluck the plants and check the size of their root. For plants with big roots we pour lots of water and for small roots we pour only a little water." Soon the monkeys, plucked out each plant, checked their root size and pushed it back again. As a result, many plants withered and died. When the gardener returned, he was shocked to see what those foolish monkeys had done to his garden. He realized his mistake to trust a bunch of monkeys to do his job. MORAL : Never assign important tasks to wrong people.